September is here and to be honest there aren’t a whole lot of nice things I can say about the month. September means fall is close, and I dread watching the garden shut down for the winter. You wouldn’t guess it from the thermometer, since last week was up into the 90’s again, but the sun is setting noticeably earlier and the mornings are much more dewy than any self respecting July morning would be. 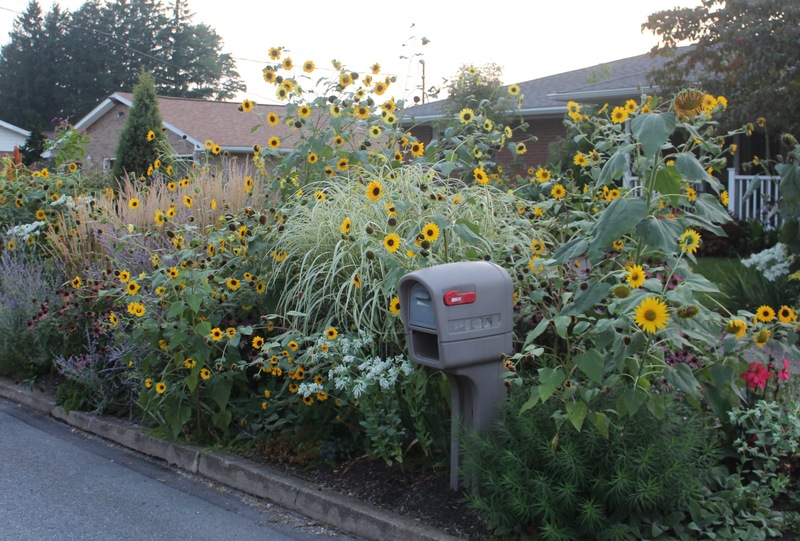 The sunflowers along the street keep a steady stream of birds flying across the yard. 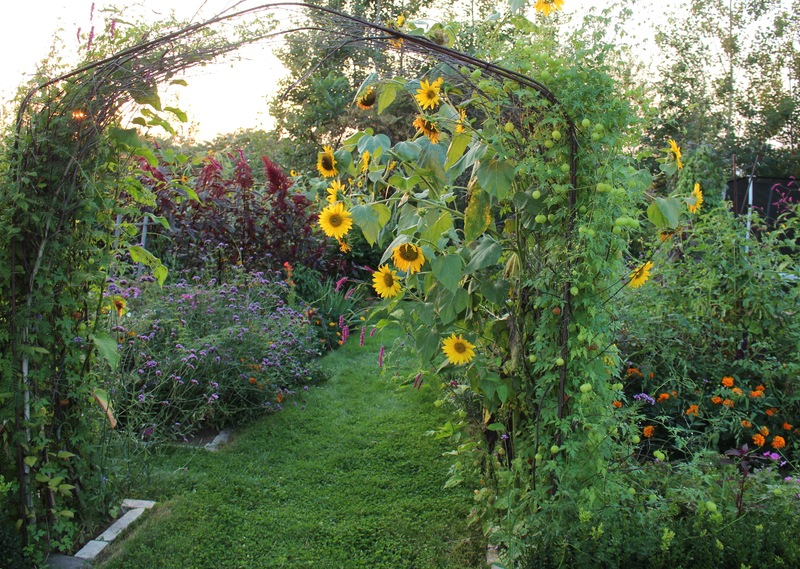 Between ripe coneflower seeds and juicy sunflowers there’s plenty for them to munch on. I managed to make a tour of the garden Wednesday evening after the worst of the heat had passed and since it was far too hot to actually do anything else I at least managed to take a few pictures in between waving off gnats and swatting at mosquitos. That was no small feat considering the mosquitos these last few weeks are the worst of the season, with a thirst for blood unparalleled outside of a salt-marsh, swampland or the great North. They like coming in straight for the face, and as a wearer of glasses I’ve never had to slap at myself so many times while struggling to keep dirty fingers from knocking the glasses right off my face. With all the rain we’ve had this year, the front border and most of the garden in general looks very similar to last year’s extravaganza. I would apologize ahead of time for showing the same old plants again and again, but I’m pretty sure that’s just overestimating how closely anyone other than myself follows this blog. 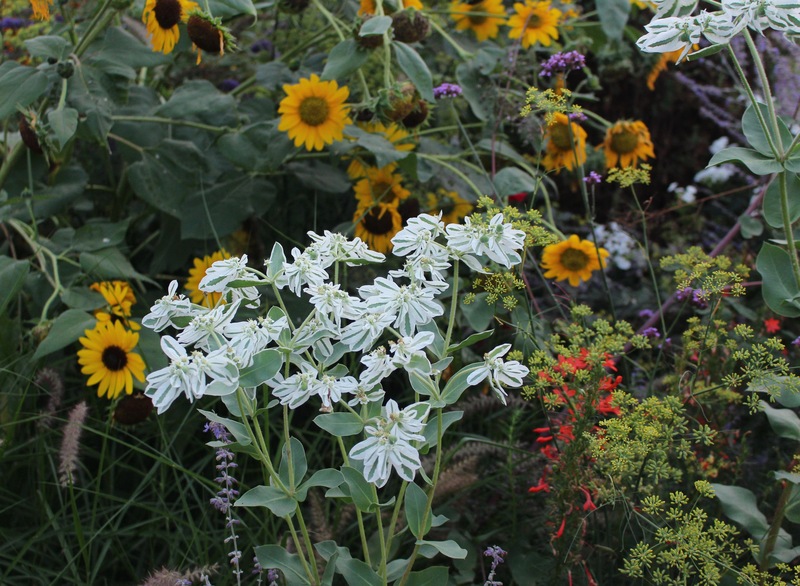 So in addition to the sunflowers and amaranthus, here’s another perennial annual which keeps coming back, snow-on-the-mountain (Euphorbia marginata). Snow-on-the-mountain is putting out its bright white bracts to coincide with the opening of its tiny white flowers at the center. These always seem to find a perfect spot to place themselves. Zinnia ‘profusion apricot’ looking ok once it’s out of the bright sun…. In full, hot, blazing sun it looks a little washed out though. I have no cardoon this summer. I miss it. After nursing a potted cardoon along all winter in the garage, and carefully keeping it in the Goldilocks zone of not-too-hot, not-too-cold temperatures while the weather outside came and went, I promptly sent it to its death once it went back in the ground. Too much rain and probably too much freeze one night did it in, but at least my candlestick plant (Senna alata, aka Cassia alata) has come along to fill the void. At five feet and counting there are still no signs of flowers on the candlestick plant. It will be stupid of me to try and overwinter this thing, but studies show…. For as much as I love the foliage on the candlestick plant, I really shouldn’t thumb my nose at the other leaves in this garden. 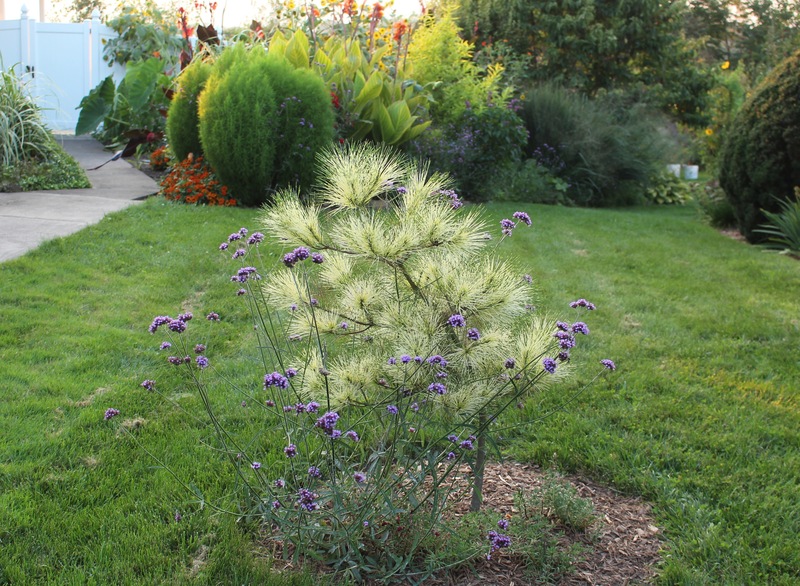 On the way back towards the tropical garden my Charlie Brown Christmas tree is finally looking a little better now that this year’s new growth has replaced the scorched brown needles from last winter. Pinus densiflora ‘Burke’s Red Variegated’. It’s a big name for a little tree, but I like the ‘character’ this tortured little thing is developing. Unless it dies… then less character and more growth would have been a better thing. Can I show off the tropical garden one more time? The cannas are fantastic this summer. A few in the back have been stunted by some I’m-sure-they-won’t-get-too-big sunflowers, but the rest have really enjoyed the steady rain and generous heat and humidity. Yellow striped ‘Bengal Tiger’ is my absolute favorite. Canna ‘Australia’ with a mess of just about everything else. As usual the tropical garden has become an eruption of growth but unfortunately this year it’s about as far as I get when it comes to maintenance in this part of the garden. Out of curiosity I let the neatly upright switchgrass (Panicum ‘Northwind’) seed out along the border just to see what turned up. Turns out a mess is what showed up. The seedlings are beautiful and graceful, but just too big and broad compared to mom. I’m thinking they’ll disappear this weekend, but my to-do list always has a way of evaporating when I actually get out there. I’m not saying I have a tendency to let things get out of hand, but what used to be neatly mown weeds and grass under the deck has turned into a mass of jewelweed (Impatiens capensis). I like jewelweed. Something about it makes it seem so harmless even when it’s pushing five feet and has covered up every other weed in the bed. 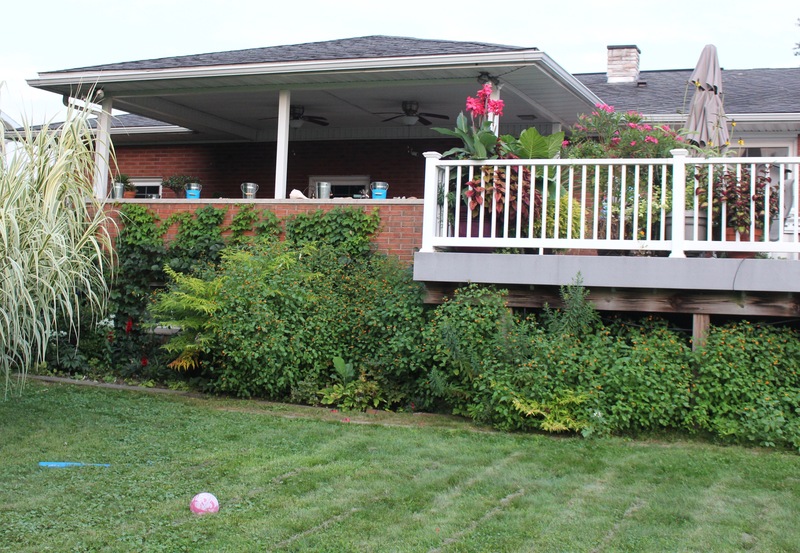 Maybe the fact it’s a native wildflower that wins me over, or the cool exploding seed pods or itch-relieving sap the plant produces, whatever it is I don’t miss wrestling the mower around to get under the deck. Jewelweed filling in under the deck. It does fill the space nicely, and its small orange flowers are popular with the local hummingbirds. Harmless giants seem to be a dime a dozen out back. 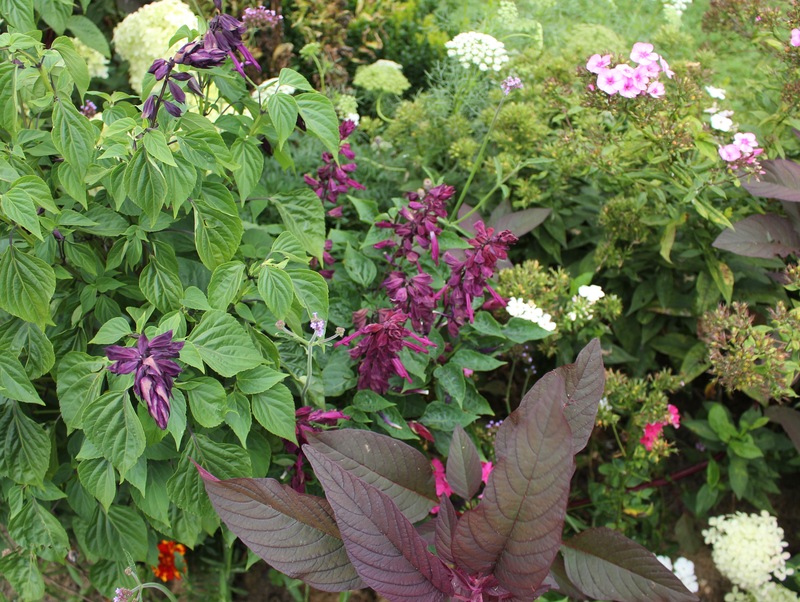 Throughout the potager (looming over the last few vegetables) are more yellow sunflowers plus the dark garnet of ‘Hopi Dye’ amaranthus. pink kiss me over the garden gate (Persicaria orientalis) dangles down from 8 foot plants, and annual vines creep all over. One sunflower managed to place its main stalk perfectly inside the wire of the trellis. I wish more of my plants self-staked. The potager really only has a few peppers, zucchini, and eggplant remaining. The tomatoes are just a thicket of foliar diseases and a halfway decent patch of celery has rotted away from too much rain. Fortunately there’s always verbena bonariensis. It’s filled in many of the vacant spots, and I hope come September and October the Monarch butterflies find it to their liking. Last year was an excellent butterfly year for us, and I think this year’s migration may be even better! The garden rarely makes it into September this lush. Green all over, and much of it isn’t even weeds! One last thing to mention, if only because I think it’s a cool thing. The salvia splendens seeds started in spring were supposed to be a dark purple just like the purples who’s seed I’ve been saving and who’s seed I’ve been sowing. Every now and then one comes up a less interesting, paler color which I get rid of, but this year one showed up with a little more red, maybe a garnet color if you want to call it that. I’ll have to save seeds of course. Salvia splendens plants in purple and a slightly shorter plant with garnet flowers. They’re late bloomers and I look forward to having them come along at this time of year. Seed saving and bulbs, I guess they’re the next big cycle in the year of the garden even though I’ll try and put them off as long as possible. It may be September and there might be pumpkin spice showing up all over the place but I’m not giving up on summer until at least the leaves start dropping and I’ve got a windshield to scrape. Yes it’s denial. I’ll think about facing fall in October and to be honest that’s still plenty of fall for me. 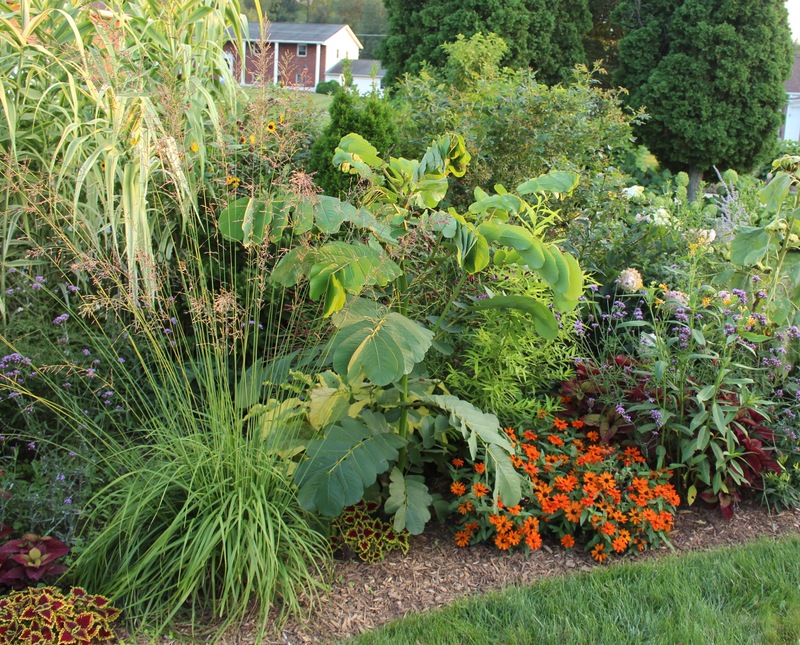 This entry was posted in annuals, foliage, front border, late summer, summer bulbs, Tropical garden and tagged cannas, flowers, gardening in pennsylvania, Summer. ← Where is Summer Going!? Looks Wonderful – love it! Thanks Paula. I wish you lived closer so you could stop by. Your borders are fantastic, they must make your neighbours really happy as they walk/drive by! 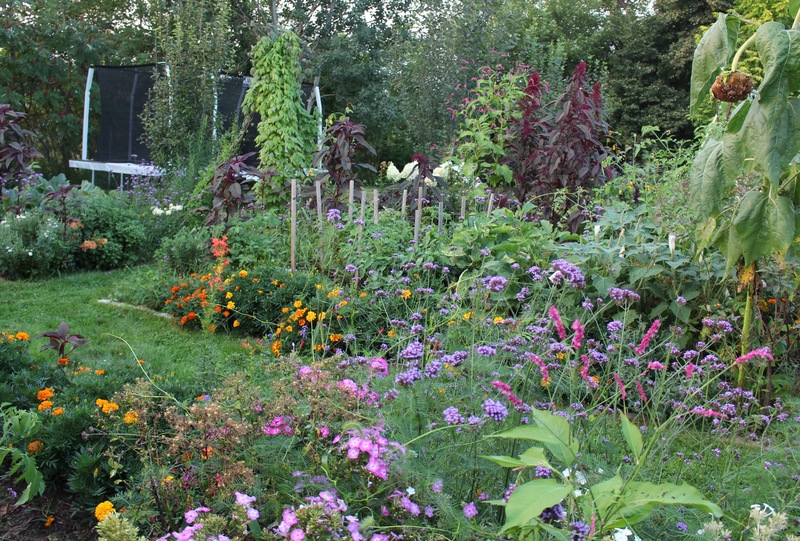 I never tire of seeing/reading about your garden. It always makes me feel inadequate though. You work, have a family and yet your garden is full of plants blooming and grooving. A testament that if you want it you can have it. I love the Jewelweed. I have tried to start it many times yet haven’t been successful. I can just imagine all the hummers buzzing along that stretch fighting over each little bloom. Enjoy all while you can. I am sitting here hoping the fall rains will commence. It is dry as toast here. That switch grass is a mad mess. I am not fond of grass so I wouldn’t have a bit of trouble ripping out those seedlings. Have a great weekend. The garden does take time and I do enjoy it, but I’m far less busy than you might imagine. Ignoring all my friends most of the summer really helps clear my calendar! I think the jewelweed just moved in on its own and has now spread to every damp corner of the yard. When we get another dry summer I suspect nearly all of it will disappear, so I’ll need to find something else to keep the hummingbirds happy! This year I decided a couple areas are just too much work. I’m looking at groundcovers and a few more shrubs, and annuals only in just a few bare spots. I hate watering and in a normal year most of these would have been left to die, so I don’t want to set myself up for too much guilt! The 90’s were short lived, weren’t they? So much cooler this weekend, but the mosquitos are still as thirsty as ever. It was a strange summer, and I suspect it will be a strange autumn as the hurricane season kicks into gear. I always feel on edge when those warm bands of tropical weather swing through just when it’s cooling off. 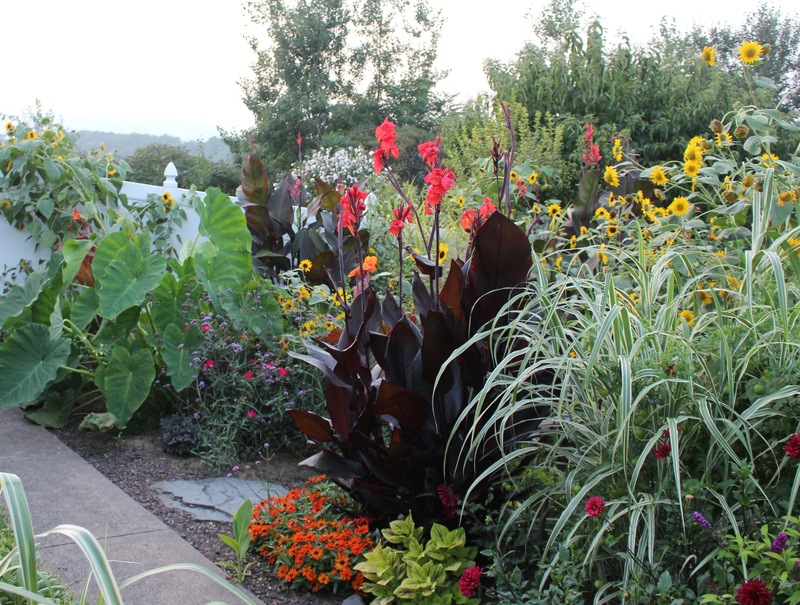 Your gardens are always in top shape regardless of the year. I still have to check out your last post on your new arrival! The garnet one does look like a good plant – it’s very floriferous too. Your sunflowers look so pretty, and I just love your front border! You have such a great eye for textures. After all this heat, I am actually looking forward to fall. I had snow-on-the-mountain seed itself in my garden one year. I was hoping it would spread itself around, but sadly it disappeared. Your Bengal Tiger cannas are absolutely incredible. I’ve actually never really cared for cannas all that much, but I think that changed with your picture. I always grumble as I dig the cannas each fall, and plant them out each spring, but to see them now while many other things are calling it quits makes it all worth it. Plus they’re so carefree as long as they get plenty of water. If pushed I might admit fall isn’t all bad. We had enough rain so the soil should be perfect for planting and transplanting. Hah! I guess you can tell there aren’t many garden visitors here. Open mouths aren’t a problem and the bugs have to resort to flying into ears and eyes and any other opening they can find in order to set me off into fits! You are right that we don’t always exactly remember what plants we’ve seen before in someone’s garden. Besides, what else are we going to show but our same old plants and a few new faves. Love ‘Hot Biscuits’ name, color, everything. First time I’ve ever fallen for this plant. 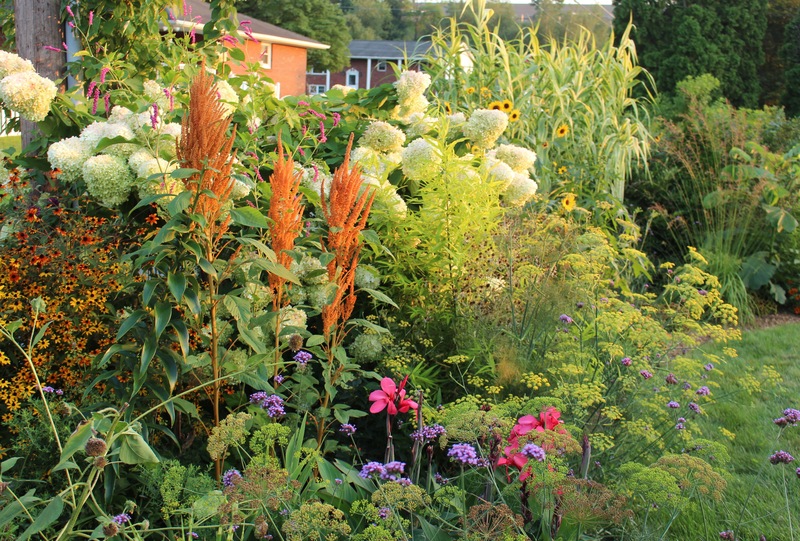 Everything looks lush and lovely in your garden which is hard to achieve at the end of August. I am hoping it stops raining and dries out here in time for me to plant all the bulbs and perennials still on order. Glad to hear you’re expecting all kinds of new things! I have a bunch of tiny, expensive things on the way, which don’t make much of an impression on anyone other than myself, but of course I’m completely excited! I mowed the lawn in the rain today. It was more of a drizzle most of the time but I don’t want to wake up tomorrow and sip my coffee while looking at a mess. My cannas never get as big as yours. But I agree with Linda and all the other commenters: everything is looking pretty d*mn good for the end of August. 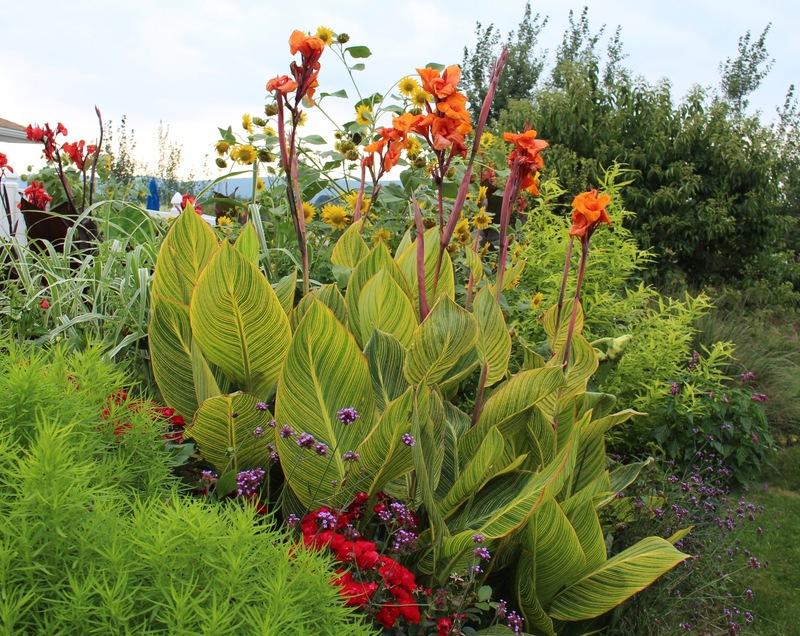 We had some pretty hot and humid nights and I think the cannas loved it this year. That’s one of the benefits of living so much further south lol, but actually I think we’re also a bit warmer being in the valley. I love it all. Thanks for sharing! I love September; maybe because it is my birthday month or because here it is often like a second spring after rain which often falls in late afternoons this month. Maybe because it is cool enough to enjoy gardening again. Btw your garden is looking great so just enjoy it while you can. I would love fall if there were a guarantee of rains but so often we sink into a dry spell just as the weather cools off. It’s beautiful to be out and about, but if you’re waiting for a nice watered soil to dig in you’re out of luck. This fall will be an exception though. I don’t think all this moisture could ever disappear, and I’m wondering what it means for our winter weather! Spectacular! Everything looks wonderful. Candlestick plant and the standing cypress from your previous post are going of my list of Plants to Try. I bet you would even have half a chance of getting a flower on the candlestick plant, even though the foliage is a big part of the fun. I have a veritable grove of orange seedlings growing alongside the house. They’ve done very well, thanks again! Summer will last forever! I join you in denial. While I love fall, it’s what follows that I could do without. If we could simply skip the months of January- March, life would be good. 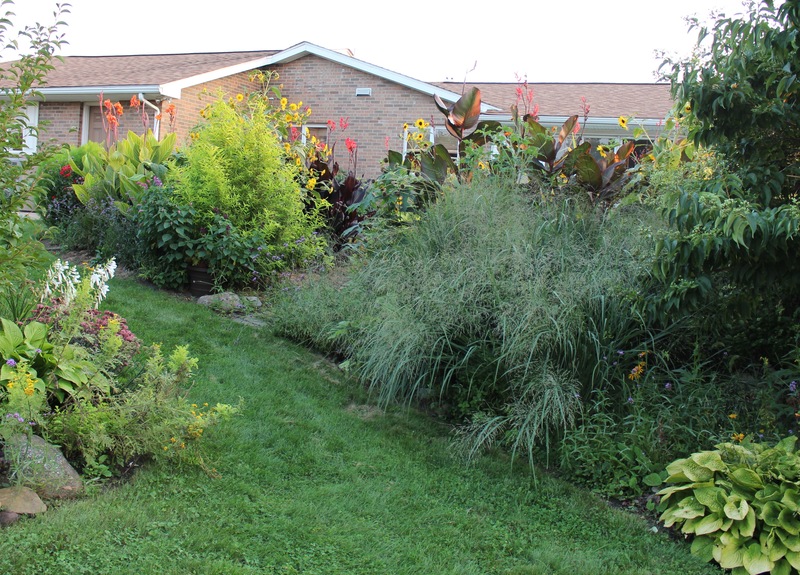 Look at you creating a pollinator-friendly native plant area. You wouldn’t believe all the pollinators, I think there are so many they manage to eat all the baby caterpillars and other bugs which could use some space as well. Still it’s fun to watch all the flying and buzzing. Amazing! Everything is so beautiful. I love your Snow-on-the-Mountain – mine disappeared after showing up by itself three or four years in a row. You must be getting hummingbirds with all that color and Jewelweed to boot. I too am sorry the days are getting shorter but I look forward to fall, I don’t know why. I guess I’m just ready for a change. I love your Sunflowers! 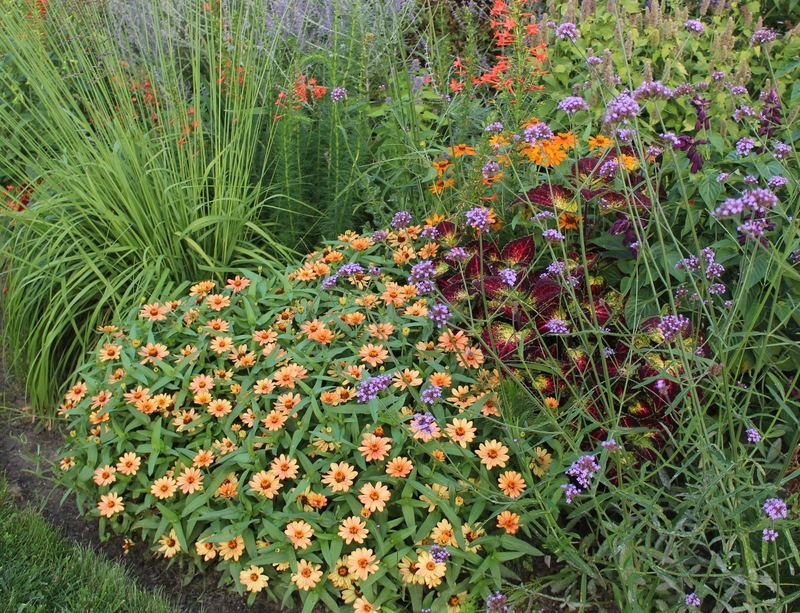 As for the Zinnias, I like the ‘Profusion’ series a lot – maybe try ‘Profusion Orange’ or ‘Profusion Fire’. Very sad to see summer slipping away again, though I’m ready for the cooler weather to return. Yes cooler weather has its pluses but honestly today it feels downright cold! I almost always grow a few of the zinnias, but I’m always hostage to whatever few colors they’re offering since seeds are relatively expensive. Last year I tried zahara sunburst and the two colored flowers were awesome! I agree that Zahara ‘Sunburst’ is exceptionally nice. I always love looking at your garden, Frank! By the way, I am also a mosquito’s favorite food. Do you have the all-day-biting Asian Tiger Mosquito? They start appearing here in July. … and yes, I’m sure we have the Asian Tiger as well as some other annoying one that is out early and goes straight for the face, ears and neck. I don’t think it’s the Asian Tiger though since it seems smaller. Hard to say though because I’m usually only examining a small smear of legs and wings. Your garden looks great Frank, and the weather seems to have been perfect for those tropicals. Love those canna leaves! September here is still warm but we finally got some rain and the grass is green again. Isn’t it amazing how some plants manage to survive such extremes! Enjoy the rest of September! Thanks Cathy. Glad the rain came by, a dry fall can be just as bad as a droughty summer. Oddly enough it’s warm and humid again today. I wasn’t expecting that, and the fact it’s drizzly as well makes me really appreciate (and miss) the crisp air of autumn!